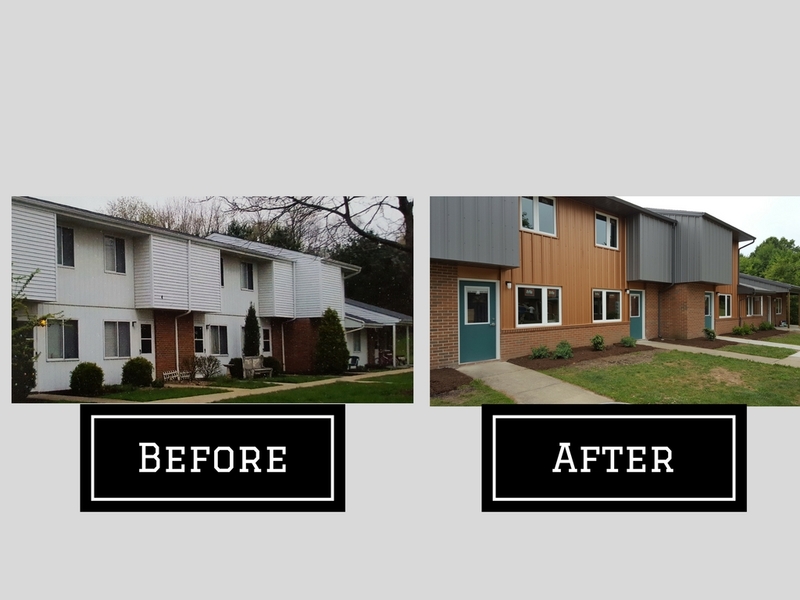 Since 1981, Reynolds West Estates has served as a vital housing resource to Mercer County by providing 101 affordable townhomes to low-moderate income families. We are excited to report that as the New Year begins, construction is now 40% complete. All renovations will be complete in the fall of 2017.
a.m. RODRIGUEZ ASSOCIATES inc. has hand selected a highly capable design team to coordinate the development process. Thoughtful Balance Architects prides themselves on simplistic conservation of resources, affordability, and sustainability, while striving to further green building techniques by implementing Passive House principles. Franjo Construction brings ample experience and has achieved Silver Leadership in Energy and Design (LEED) certificates from the U.S. Green Building Council. The assembly of these notable organizations working together will ensure future success for generations of future residents at Reynolds West Estates. We are pleased to share that the renovations are not only limited to interior and exterior modifications. The 101 townhomes will receive new plumbing systems, replacement of heating and cooling systems and modernized kitchens and baths. Modifications have been thoughtfully planned with energy efficiency as a leading vision. The current computer lab will also be upgraded and be staffed to provide computer training, assistance with homework, resume preparation, and assist residents with GED preparations. A Social Service Coordinator will also be onsite to assist residents with community services. A redesigned Community Room and revamped common areas are also part of the scope. The enhancements at Reynolds West Estates will be beneficial to the low income families so that they can continue to progress to self-sufficiency. For more information on Reynolds West Estates please contact (724) 646-1450.